There is broad public consensus that the budget negotiations of recent weeks can be summed up in words such as ridiculous, disgusting, stupid, and frustrating. Nationwide, 72% describe the recent negotiations in negative terms such as these; while very few offer a positive (2%), or even neutral (11%), assessment. Other frequently used terms include terrible, disappointing, childish, and joke. The latest survey by the Pew Research Center for the People & the Press and The Washington Post, conducted July 28-31 among 1,001 adults, finds that these critical views cross partisan and ideological lines, with 75% of Republicans, 72% of Democrats and 72% of independents all volunteering similarly negative assessments. Impressions are particularly negative among Republicans and Republican-leaners who agree with the Tea Party (83% negative). Overall, this reaction is parallel to how the public viewed the budget negotiations surrounding the possible government shutdown in early April of this year. 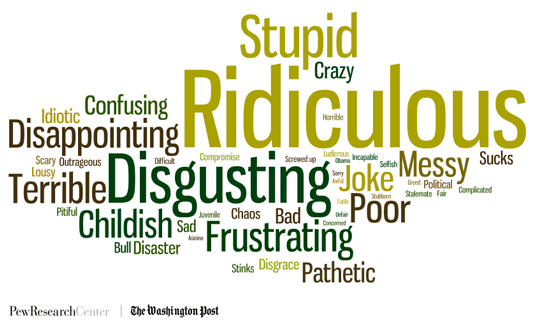 A Pew Research/Washington Post survey conducted in the days immediately following the April 8 deal found Americans offering similarly negative reactions, and, for the most part, using the same combination of words to describe the situation.